Did you know that colors communicate? The use of color in design can be an essential part of how your visual aesthetic perceived. Color usage can either make or break your designs, and I will show you how to choose your colors wisely by understanding what they communicate. When new visitors land on your blog, the first things they interpret are colors. Before they read a single character, their brain is registering colors which are subconsciously (or consciously) tied to emotions, states of mind, or preconceived ideas. If you do a poor job at putting together the colors in your blog design, it can be detrimental to the growth of your brand. This is part of the Blog Design Essentials series. Check out the rest of the posts here! You may not know this, but colors have a very significant effect on us both psychologically, and even physiologically! 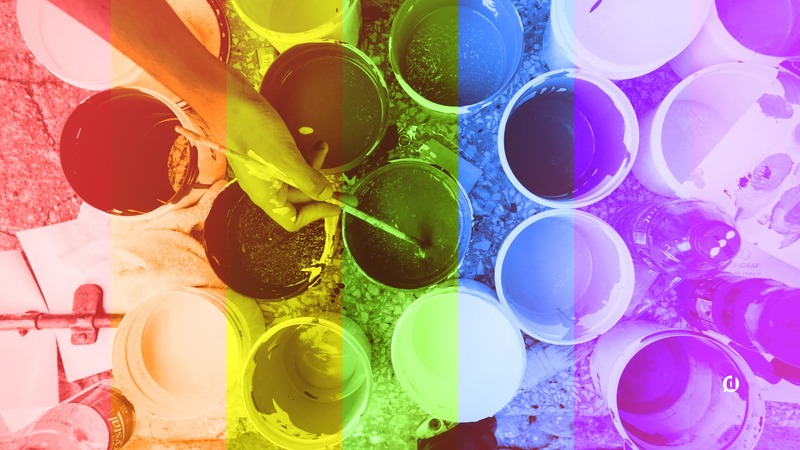 Certain colors can change our state of mind, or even affect our physical state. Is that crazy or what? This happens to be my favorite color– as if you couldn’t tell. Red is the most eye-catching and exciting color in the entire spectrum. It’s eye-catching, exciting, and demands attention. But did you know that the color red actually increases your heart rate? It is perfect for accent colors, calls to action, or anywhere you want to draw people’s attention. Be careful though, because overuse of this color can cause a negative emotional response. Probably my second favorite color. Orange is also an attention getter. Distinct from red, orange is a color that is mostly associated with fun, ambition, and youthfulness. It is also a great color to use for accents and calls to action. Unlike red, it is not as easily overused. This is the official color of optimism and happiness. Maybe that’s why smiley faces are always this color. 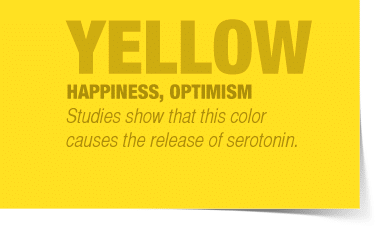 Studies have shown that the color yellow actually causes the release of serotonin in the brain, which is a chemical that positively stimulates your brain. Basically, it produces “happy” chemicals! This color is also best used in small amounts. Too much yellow can be overpowering and shouldn’t be used as a dominant color in a scheme. This is the easiest color for the human eye to process. 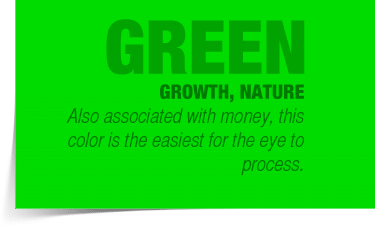 It’s easy to look at and is associated with growth, nature, and money. It can also be a very relaxing color for some, which is why you’ll see it used in a lot of leisure and “zen-like” design. 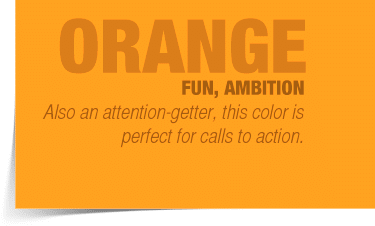 If your goal is to communicate growth this is the color you want to use. This is a very safe color to incorporate into your design. Since it’s most people’s favorite color, you’ll immediately appeal to a wider audience. A color that has traditionally been associated with royalty and prosperity. Studies have shown that the color purple actually stimulates problem solving in the human brain. That’s interesting. Caution though, studies have also shown that overuse of this color can give people the impression of falsehood, or being fake. Use this color as an accent, and sparingly. A solid, timeless color that communicates strength, sturdiness, and longevity. 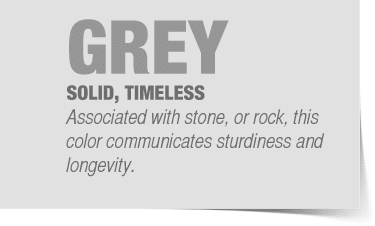 Likely because things that are grey have these same attributes: steel, concrete, stone, Apple products, etc..
You can never go wrong when incorporating this color into your design project. It can be a great alternative to white, and give things a modern, yet timeless, look. 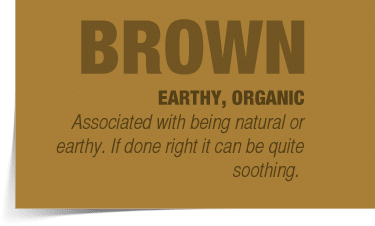 Earthy and organic is what best describes this color. Dirt, trees, potatoes– all things found in the earth. It’s also the color of my favorite beverage– coffee! When used properly, it can be a soothing element and give an organic feel to your design. 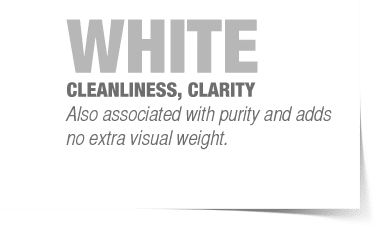 The lightest color both visually and in psychological weight. It gives a light feel to your design, and is best used to give your design breathing room. Associated with purity, cleanliness and clarity I think white is a great color to incorporate into any design. 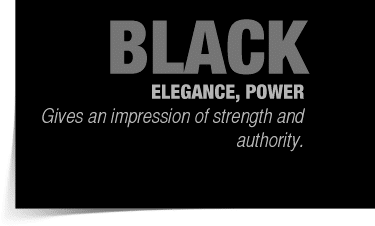 The color of elegance, power, and authority; boldly stated and seemingly unshakeable. If you’re trying to communicate strength be sure to incorporate black into your design. I am of course talking about all these colors in their most basic form. Surely a neon-green will be more attention-getting than a dull red any day of the week. 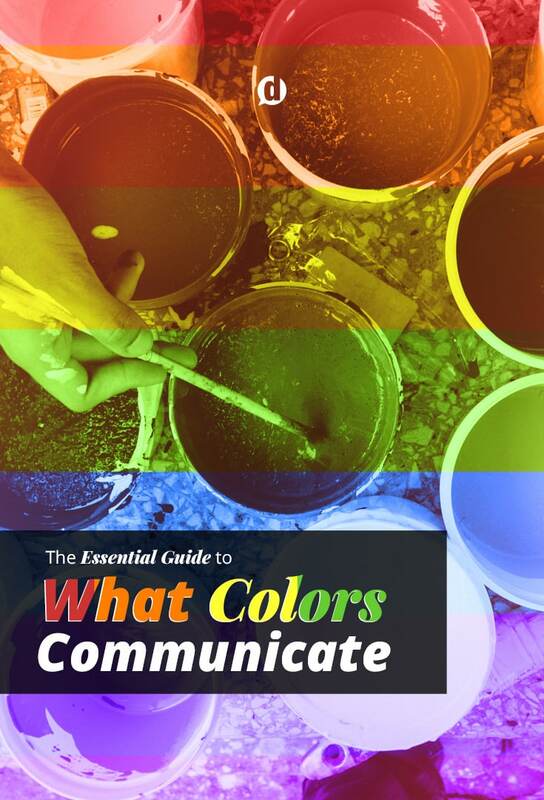 So these are merely a starting point and general guide to what colors communicate. I’ve created this simple chart for you to download and reference for your current or future projects. Please feel free to share! Unfortunately I have way to much to say about picking the right colors, so instead of making this post the size of a small novel, I decided to break it up over 2-3 different posts. In my next installment of the Blog Design Essentials I’ll address how many colors to incorporate, and helpful tools to put together the perfect color palette. Has any of this caused you to re-think the colors you are currently using in your blog design? You can leave a comment by clicking here. This post was really helpful, thanks! I’m also looking for information on what colors appeal more to men vs. women. Do you know of any articles or have any other blog posts that can help with that? Hi, Meghan! Glad you found it useful. I haven’t done any male vs. female color psychology research as of late, and wouldn’t know where to point you besides Google search. If you find anything interesting, do let me know! This post is due for an update soon. 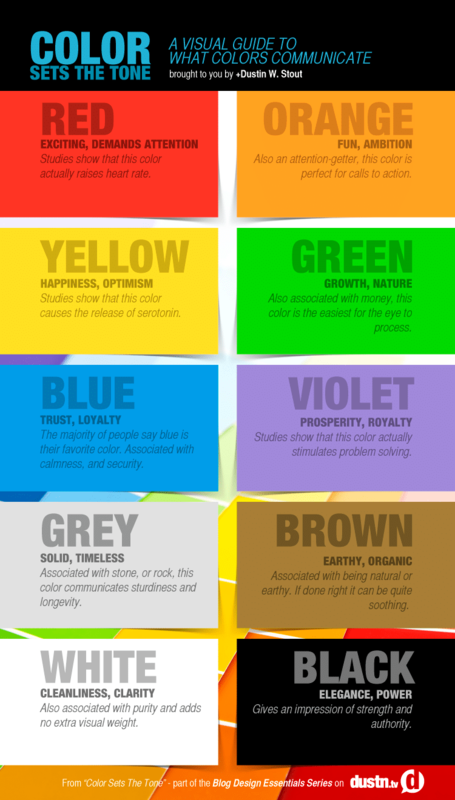 It’s cool to learn about colors and psychology. 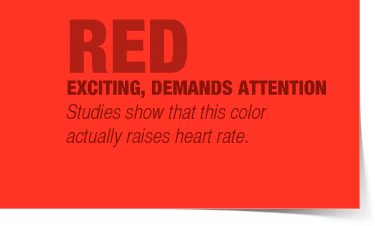 Red is my favorite color as well, so it’s cool to know that it can increase your heart rate. Is that helpful in a call to action for marketing? Hi, Ridley! Yes, it’s absolutely helpful as a call-to-action in marketing. As long as you’re using it as a contrasting color and not in an overwhelming way. Good post! I actually had a client asking me about strategically using colors on their site to produce desired actions with their customers. Although there’s value in choosing specific colors based on what they symbolize, I told him to play with the coloration on the site first and we can play around more once he chooses a color scheme that he likes beyond the current white and gray. Dustin: I’m using your site as one of my references for a college presentation about the role of color in non-verbal communication. Very useful. I’ve “borrowed” that graphics you included with each color for use in my presentation. Rest assured you will be referenced as the source of the graphics, I believe in giving credit where credit is due. Thanks for the info, you’ve been very insightful and helpful. Awesome Allen! If you need any further help, just reach out via my contact page. I chose purple as my site’s basic color, and my newsletter subscribe form’s button is also purple. Is it ok? Is there any problem that would cause people think of “falsehood, or being fake”? I think it would help you answer if you take a look yourself (it’s a popup just like yours when you wann leave the website). Website’s address is in this form’s Website field. Anyways, your article was really helpful to me, thank you! Hi Alexandru! I think your implementation is fine. You’re not using a gaudy purple so it’s not overwhelming at all. I love it, la explicación fue precisas, gracias. thanks dustin for this great stuff. There are books published about cultural differences regarding colour. I was given one when I retired from teaching. If I can find it among my books I will forward the name. I know one of the reasons that teachers are changing from red to green when marking papers is due to cultural differences in our ever changing cultural fabric. Yea, it’s fascinating how color psychology can change from culture to culture. I go with Yellow and Green. This article helped in my presentation. Thank you. Dustin, do you know where we could find some material touching on the cultural perception of colors? For example, red in some Asian cultures is prosperity and white is for death. I have been looking without much luck. And thank you for the quick reference. Gio I don’t know of any sources off hand. My research has mostly been from an American cultural perspective (that’s all I know). If you end up finding such a resource, please share it with me! Should I be so lucky, I will! I love communications. Hello Dustin. Thanks for the resource. I am wondering how you arrived at these results. I know you mention, “studies show . . . ” on some of the colors and not on others, but I am curious about this underlying research. Do you have some resources that back up the claims here? Thanks bunches. I’ve read so many articles it’s ridiculous. I wanted to cite a few of them, but for one reason or another I didn’t. A quick Google search will find some great resources. One of my coworkers directed me to your site. I teach a Design class at the high school level, and have a lesson on the use of color and the meanings behind them. I love your reference infographic and would love to have it in poster form for my classroom for my students to use. Any chance of that? I know I’m not the only teacher out there thinking this! Thanks for the great info! Thanks for the compliments Malinda! I didn’t create the graphic in a large enough print format… email me though – dustinstout.com/contact. I run an environmental education organization, the Burns Bog Conservation Society. This information is just what I need. everyone thinks because we are an environmental organization that we need to overdo the “green” when it is actually another message that I want to get across. e.g. blue, touches of red and even grey. I like what you say about brown. There was a Canadian organization that used brown a lot and I liked it. Now they have completely changed their emails and I miss the way they used brown to separate news articles into white boxes with the brown background. Really interesting post, thanks, given me something to think about. I’ve signed up for your updates now, and got a gravatar thanks to you too! Thanks Dustin for your effort, I’m sure that will help much people. Dustin…what a great post and so informative! 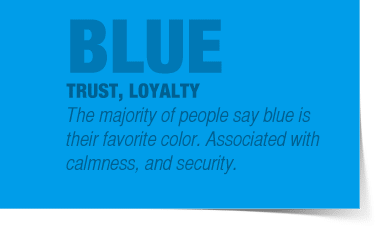 My dad always told me what you stated about the color blue. I guess dad was right. I am going to clink over to my blog and pay attention to the colors. Thanks, love this post! Your dad must be a very wise man! Haha! I just came across your creative brilliance today and will be following you going forward. Thanks for the color reference chart. Very intuitive. Thanks Ivan! I really appreciate that! There is no better compliment than the fact that you think it is worthy of sharing. Orange is a great choice Tyler. And I’m with you on the “blue being overused” thing. Have you tired going on the sites that I mentioned in the next post in this series? 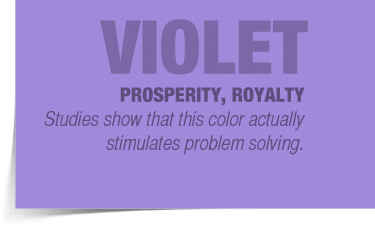 It’s great that you can explain colors, because I always read what colors mean and then forget after a while, I remember that silver is timeless, expensive, and purple is regal or royalty. So when I design, I troll the website for pictures and listen to how I feel, how they have an affect on me, and then I use those colors. It’s kind’a cheating, but I think it works. Good stuff right here. Thanks for the resource! We were using a green and blue, but recently made gray more prominent. I’ve been thinking about this in regard to my site. Thanks for the practical info! You’re very welcome! What colors are you thinking about using? My main colors right now are orange and blue. Well I went to go check out your site to see, but it looks like you’re already making changes! Haha! Let me know when you’re finished, I’d love to take a look! BTW… do you have a Gravatar? I really like this a lot. I love the color explanations. I will definitely share this. Great Andrea! Thanks for your feedback! It’s interesting that most design at the moment is heavily white, grey and black influenced (though i guess they are and always will be classic colours) I’m currently using some very Team Great Britain Inspired Olympic colours of White, Navy blue and red which I really like. Indeed I am! The spell check (blog or browser I don’t know) picked up on it but I left it in to point out that I am! I guess they’re the same colors 😉 as team USA the bold reds and blue seam to compliment each other nicely (I think.) Have you thought of doing anything about complimentary colours (see Instinctively go for the UK version) That could be useful too. I could probably do something on complimentary colors… But if you see my newest post, Choosing Colors Like A Pro, I mentioned Kuler– a tool I use to put together awesome palettes. It actually has a feature where you can choose a color and have it automatically select complimentary colors!